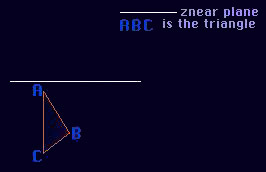 The main purpose of z-clipping is to prevent a triangle from trashing memory and drawing out of the screenspace. Okay, now let's get busy. Now the intersected point is C. So you draw a new line AC instead of AB. Think of your triangle as three lines. Just make a procedure for finding the intersected points. So you see: All the axes here are reversed. Unlike in computer, the bigger the Y-axis is, the more below it is. because all the triangle is behind the plane and it's invisible. Just find the intersected points and draw two triangles. For comments, insults, threats, email bombs or if you need help, contact me. Greetings go to: kalms, kombat, sosay, velocity, mrz_ai, phred, nick-s, borzom, civax, smallbrain, yoyo, trashey, cycat, adok, cube, radium, lord^crc, gfunk, coaxcable, adept, trip, satanic jungle, gyr, octan, bananmos, biomass, idiotboy, gash, macaw, matja, parody, tanis, timluther, TNSe^98, xls, zippy, sarix, sagacity, gash, asm[exe], the lotus. I hope that I didn't forget somebody.